When the United Nations was founded in 1945, it had just 51 members; today it has nearly 200. By 2050 the UN could well have 250 members….or perhaps it will be replaced by something more appropriate to the times. We are entering a phase of history in which cities are superseding countries in importance — and a “United Cities” might be more useful than a United Nations. These maps, designed exclusively for publication in my new book “Connectography,” illustrate how cities have become the organizing units of the 21st century global system. 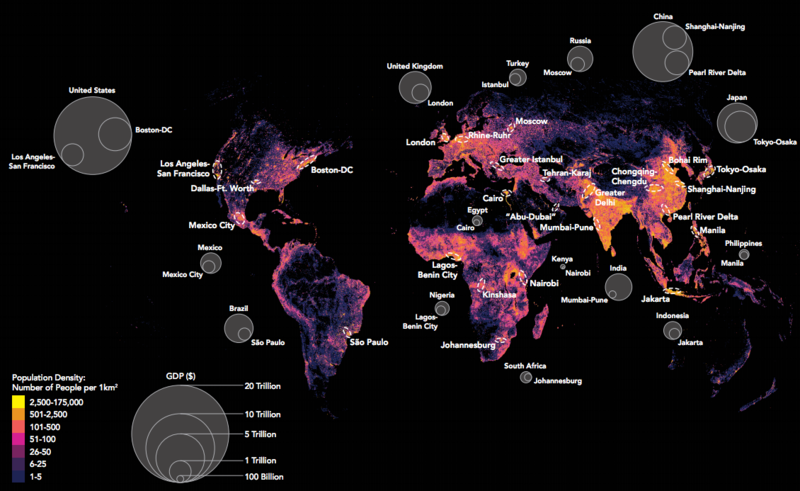 Cities have become the world’s dominant economic and demographic clusters. This map shows the distribution of the entire world’s population, with yellow representing the most dense areas. Surprisingly, these zones are not where you find the dashed ovals, which represent the world’s burgeoning mega-cities. In fact,mega-cities are growing so large that the urban surface area is expected to triple by 2050. 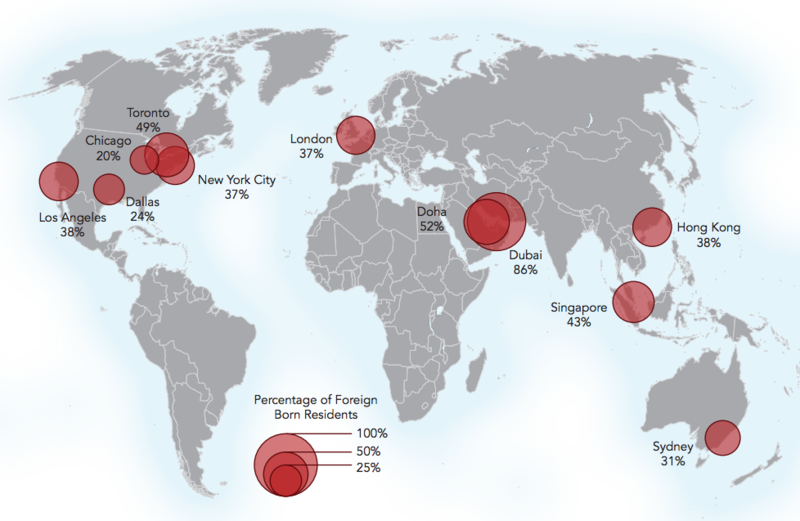 Mega-cities are also growing in their economic gravity. In emerging markets like Brazil, Turkey, Russia and Indonesia, the leading commercial hub or financial center accounts for at least one-third or more of national GDP. In the UK, London accounts for almost half Britain’s GDP. And in the US, the Boston-New York-Washington corridor and greater Los Angeles together add up to about one-third of America’s GDP. This map of the world’s three dozen mega-cities therefore tells us much more about where the world’s people and money are than conventional maps of 200 separate countries. The way cities relate to each other may ultimately have more impact on the world than what happens at the United Nations. In a world defined by crowded mega-cities, mankind has no higher priority than sustainable urbanization. 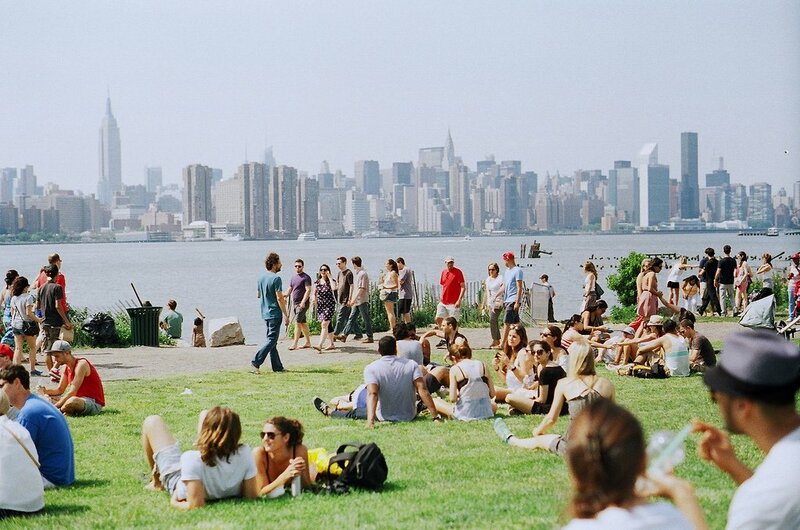 Cities are leading the way in the solutions to the problems for which they are ground zero. The Paris Climate Agreement doesn’t have enough teeth to actually reduce greenhouse emissions. What really brings down the carbon intensity of our economies is cities using technologies such as carbon-neutral building design, carbon capture and storage, solar power generation, electric car sharing systems, and so forth. This is what the C-40 Climate Initiative among 40 of the world’s largest and most industrial cities aims to do. International agreements won’t have much of a dent in reality without the participation of cities. 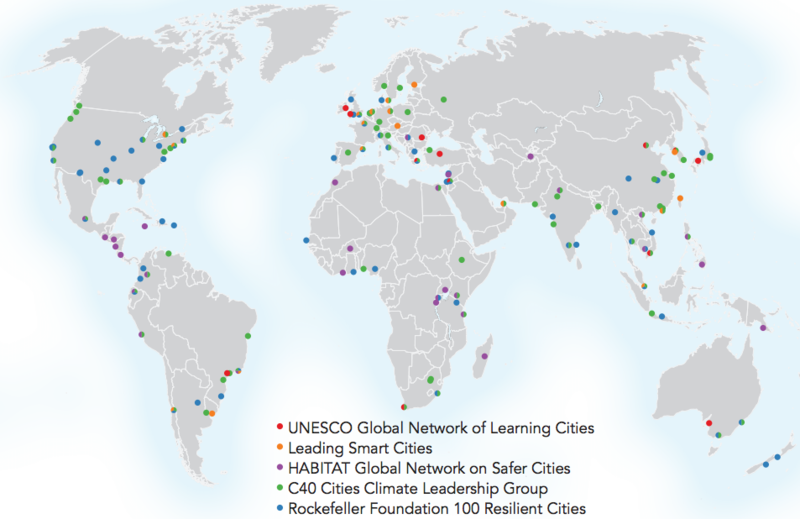 This map identifies the cities participating in just a small number of the more than 200 inter-city learning networks that are actively sharing best practices in every arena, from climate and safety to education and social inclusion. This is about the same number as inter-governmental organizations. Soon enough, “diplomacity”— diplomacy among cities— will supersede traditional diplomacy among states in importance. As migration controls return to European borders and populist movement gain ground in politics, it’s worth remembering that great global cities are open, diverse, and inclusive. From Los Angeles and New York to London and Singapore, leading cities around the world are witnessing a growing — not shrinking — percentage of their dynamic and industrious populations coming from abroad. No city in the world has a higher foreign-born population than Dubai, where almost all residents come from India and Pakistan (as well as elsewhere in Europe and Africa). These melting pot cities are the epicenters of a new kind of loyalty to cities over countries, which Canadian scholar Daniel Bell calls “civicism.” We should strive to have more such global centers of diversity and tolerance in the years ahead. A half-century ago there were only a handful of Special Economic Zones (SEZs) — designated areas with more free-market oriented economic regulations — in poor countries like Mauritius and the Dominican Republic to help boost their agriculture and textile industries. Today there are more than 3500 such zones, integral to almost every country’s strategy in attracting investment and technology, strengthening productivity and skills, and boosting exports through better infrastructure and trade agreements. 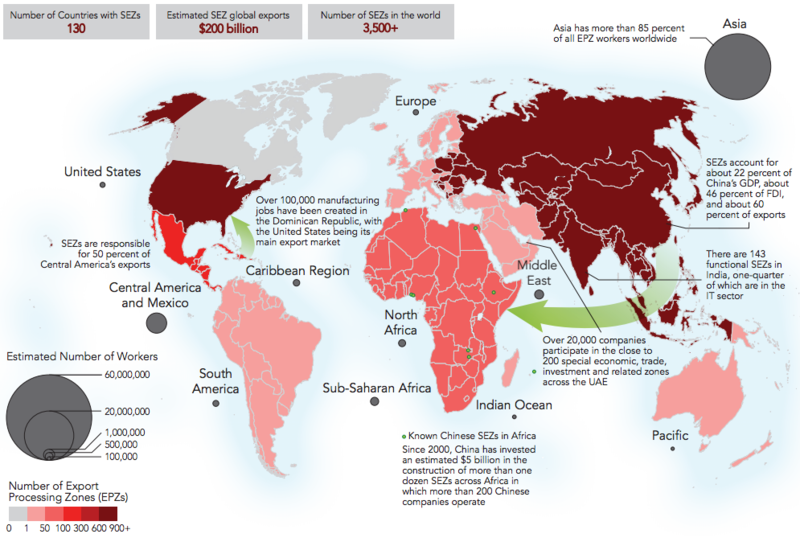 Since China declared its first SEZ at Shenzhen in 1979, such zones have grown to account for a quarter of its GDP and most of its exports. Across Asia, upstart manufacturing powerhouses like Vietnam are using the same model to rapidly climb the value chain —even stealing investment away from China. America too has its own SEZs: The Port of Corpus Christi, Texas, and Tampa, Florida, have been licensed as Foreign Trade Zone (FTZs) since the 1980s, using their tax-free logistics facilities to attract businesses focused on commodities and manufacturing exports through the expanding Panama Canal. One final reason why the world is coming to be dominated by mega-cities: because China is. 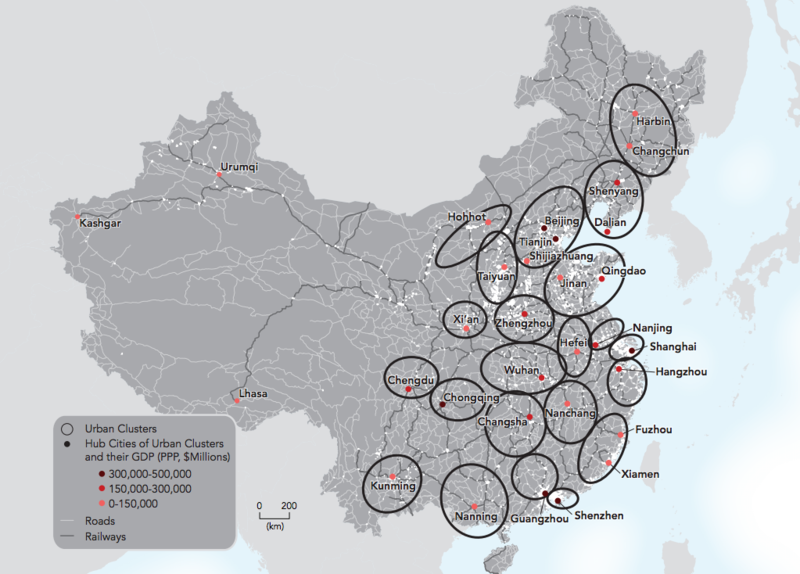 Despite millennia of cultivated provincial and linguistic boundaries, China today is reorganizing itself around approximately two dozen megacity clusters with populations as large as 100 million or more. Each megacity is internally integrated through dense transportation networks, while high-speed rail connects the entire country. India is also heavily investing in harnessing its rapidly urbanizing population through greater infrastructure investment, meaning its true map may also one day resemble a collection of big city hubs rather than dozens of weak and fragmented provinces. This is far from being only an Asian trend. Italy is reforming its political and administrative structures in order to crystallize 14 “Metropolitan Regions” around hubs such as Rome, Turin and Milan, each of which is more viable than its lethargic provinces. In Great Britain, a “Northern Powerhouse” mega-urban region is emerging, stretching from Leeds to Liverpool, and eventually giving the UK a third economic anchor besides London and Scotland. Parag Khanna is a CNN Global Contributor and Senior Fellow at the Lee Kuan Yew School of Public Policy at the National University of Singapore. This article is adapted from his forthcoming book “Connectography: Mapping the Future of Global Civilization,” to be released on April 19 from Penguin Random House.